As you search the internet, you will find very few recipes for this delicacy. 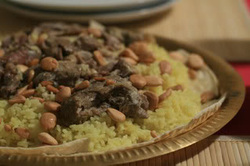 It is served in every home in the Middle East and it is served to very special guests. Mansef is as much part of the Middle East as steak and bake potato is to Texas. It is a very easy meal to prepare, but with many steps. For the huge wedding parties and dinners of condolences, the head of the lamp is placed on the mansef. This is not a sight many will like to see. Mansef may be served with the laban on the rice already or in separate bowls. It is traditional to serve in separate bowls and then each guest pours their own laban on their portion. The mansef is served on one huge tray and each guest is given a spoon or fork to eat from the large tray. For any guest not caring to eat this way, separate plates should be provided. Meat is traditionally used, but chicken can be used instead. A guest in the Middle East would be insulted if served chicken, but for family it is okay. In a large pot filled half-way with water, add the lamb. The lamb should be rinsed of all blood prior to placing in the pot. In a separate skillet place the olive oil and when heated, add the onions. Saute the onions until translucent and lightly browned. Add these onions to the pan of meat. Bring the meat to boiling and then reduce the fire to a medium heat. Cover the pan and cook until the meat is tender and done. If preferred, a pressure cooker may be used. The meat in the pressure cooker should be cooked for 40 minutes. Place two cups of rice in a bowl and add some hot water to cover the rice by two inches. Let the rice soak in the water for one half hour. Place the rice in a saucepan and cover the rice with boiling water. The water should be two inches above the rice in the pan. Add salt to taste and 1/4 teaspoon of turmeric. Simmer the rice in a covered pan for twenty minutes or until the rice is tender. Add more very hot water as needed. Take a fork and fluff the rice. There are two ways to prepare the laban. The first is the easiest and the cheapest. Take one kilo of yogurt (goat is preferrred) and place in a blender. Add one egg to the yogurt and blend on high until the yogurt is well blended. Place in a pan and continually stirring for ten minutes. Add in the meat and the "shourbat" or meat water. The mixture should be thin. Heat the meat only. Take one half kilo of "Jameed" (solid laban in cakes) and pound the laban with a hammer. The laban should be very fine with some small chunks. Add 1 cup of boiling water to the jameed and let it sit for ten minutes. Place the jameed in the blender along with one half kilo of regular yogurt (again goat is preferred but cow's yogurt may be used). Blend on high speed until well mixed. Place in a pan and follow the above instructions. Place some virgin olive oil in a pan, enough to cover the bottom of the pan. Add the nuts of your choice and brown them. Remove from the pan and drain the oil. The traditional nut is pine nut, but due to the cost many Arabs use almonds or peanuts. On the bottom of the tray should be some very, very thin wheat bread. Then put the rice on top of the paper thin bread. Top with the meat pieces around the rice and a sprinkle of nuts. The final garnish should be some chopped parsley. Place the yogurt in separate bowls for the guest to use as needed. The traditional way to eat Mansef is with your fingers, but forks will be supplied for the inexperienced. You may not copy, reproduce and imitate ideals on this website without permission of the owner.